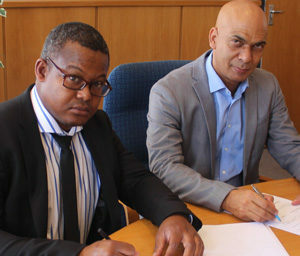 National rail operator, TransNamib and Ascon Energy (Pty) Ltd., an Ascon Group company, signed a Rail Transport Agreement mid March 2019, for the transportation of coal, containers and various commodities between Walvis Bay and the inland terminals of Grootfontein and Gobabis. The two companies formalized their business cooperation by signing a firm and binding agreement, which was signed by TransNamib CEO, Johny Smith and Nate MacMillan, Ascon Energy’s Managing Director. Next PostASCON @ IHS MARKIT CONF.